राष्ट्रगान: "स्वतंत्र लोगों की ज़मीन"
↑ "World Population Prospects: The 2008 Revision Population Database". United Nations. March 11, 2009. मूल से August 19, 2010 को पुरालेखित. अभिगमन तिथि August 29, 2010. ↑ "Belize". CIA World Factbook. Central Intelligence Agency. अभिगमन तिथि January 13, 2016. ↑ "Ecosystem Mapping.zip". अभिगमन तिथि July 3, 2012. 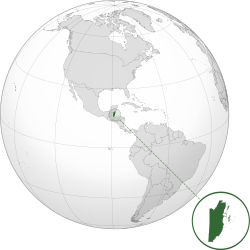 ↑ "CARICOM – Member Country Profile – BELIZE". www.caricom.org. CARICOM. अभिगमन तिथि February 17, 2015. ↑ "Reid between the lines". Belize Times. January 27, 2012. ↑ Ryan, Jennifer (1995). "The Garifuna and Creole culture of Belize explosion of punta rock". प्रकाशित Will Straw; Stacey Johnson; Rebecca Sullivan; Paul Friedlander; Gary Kennedy. Popular Music: Style and Identity. पपृ॰ 243–248. आई॰ऍस॰बी॰ऍन॰ 0771704593.